Pretty simple. A gathering of friends who like Funk and Jazz, Improject got started out by filling in for another band last minute on a gig they couldn’t do. With no rehearsal or ideas of songs to play, Improject thought, we should just make stuff up, which resulted in them improvising funky grooves all night, seeing what happens. Hey, that turned out be to fun, so they did the same thing but with a couple of microphones set up and an old Akai 1/4” 4-Track tape machine. 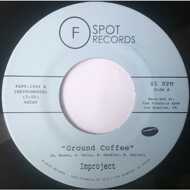 A group was born and what resulted were the “Ground Coffee” and “Steppin” recordings. Ranging from 3-5 members, Improject will set up wherever and jam your pants off.